K9 units are an essential part of law enforcement, drug prevention and even rescue operations during emergencies. At D&R, we are proud to offer high-quality police k9 vehicle equipment for SUVs like the Chevy Tahoe or Ford Explorer that will keep dogs safe and comfortable while on duty. 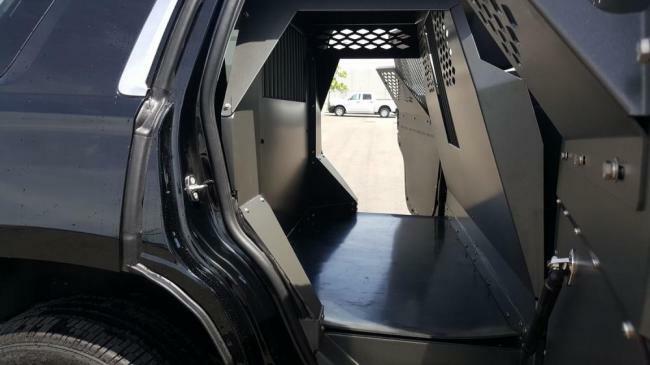 We are able to offer high-quality and durable police k9 vehicle equipment by relying on well-established relationships with law enforcement, our community and reputable providers. We can install and customize cages suitable for a single or a couple of k9 dogs which are spacious, easy to clean and equipped either with a sliding door or front bars, rear panels, windows for access and ¼” rubber mats. We employ only quality materials and equipment from reputable and trusted providers, and can customize any installation to fit the specific vehicle at hand. We take our work very seriously, and can provide expertise and precision in any installation. With police k9 vehicle equipment, officers and dogs are able to respond with ease and efficiency, allowing them to respond to emergencies around the clock. A proper cage or kennel will not only keep the dogs safe in case of an accident, but will ensure they are not stressed or anxious at high speeds. While SUVS like the Tahoe and Explorer are among the most common vehicles enforcement relies on in Ontario and North America, we can install cages, kennels and all of the complementary equipment needed in any SUV in the field. We employ precisely fabricated aluminums and plastics to ensure safety, speed and comfort for the K9 unit. Our work with local law enforcement and response agencies has given us the experience, technical knowledge and local relationships to meet the highest standards of safety and quality. To learn more about quality equipment and precise installation of k9 equipment, visit or contact D&R Truck today to speak with one of our expert consultants or to request an estimate.